Located on the banks of the Mahanadi, a predominantely agricultural district, Janjgir-Champa is poised to become a industrial hub as several mega projects are planned there. Four thermal power plants have got clearance and 13 are under process. Two biomass-based thermal power plants are also planned. The district's power capacity is restricted to a captive capacity of 121 MW. The 17 thermal power plants planned will take the district's capacity to 17,500 MW. The state has signed MoUs with 14 companies for 62 projects worth Rs 22,586 crore mainly for cement, sponge iron and steel plants. Twelve MoUs are for thermal power plants, mostly captive, bringing the planned capacity in the district to 19,000 MW. Projects cleared and in pipeline will occupy 7,059 ha, as per official record. Estimated land requirement for projects under the MoUs is 6,000 ha. Take the case of Dabhra block. It has planned nine thermal power plants ; all within a radius of 10 km. But there is no effort to assess the total impact of these projects. The current system clears each project individually—there is no regard to the total resource need and environmental damage of the combined projects. The water requirement of all the projects planned in Janjgir-Champa is pegged at about 700 mcm per year; water for the 17 thermal power plants is proposed to be drawn from the Mahanadi. These thermal power plants alone will withdraw 660 mcm of water. "We will not allow these proposed plants till they get the water clearance," state environment minister Rajesh Munat said. "A study to assess the water situation is important even though we have ample water," he added. Uchpinda village in the block is seeing construction for a 1,400 MW facility by RKM Powergen, a Chennai-based power company. The village has 700 people. More than half the required land has been acquired from the villagers and most of it is agricultural land. On June 30, 2010, the managing director of RKM Powergen had plans to meet the people regarding the project. There was obvious tension in the air. 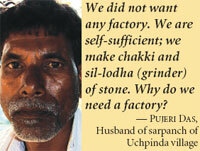 Pujeri Das, husband of Uchpinda's sarpanch, alleged that the company bought land at variable rates. The public hearing held in April 2008 was marred by violence; people burnt banners. The project was cleared in August that year. "We did not want a factory in our village. We are self-sufficient; we make chakki (manual flour grinder) and sillodha (grinder) out of stone. Why do we need a factory?" Das asked. The residents of Uchpinda and adjoining villages, Dhurkot, Bandhapali, Dhobnipali and Singhitarai, have filed a complaint with the chief minister dismissing the public hearing as invalid. They are still waiting for a response. Manohar Joshi of Dhobnipali village said, "We were against the project at the public hearing. No one from the company spoke of the project impact or benefits we will get." In Dhurkot village in Dabhra, Bhushan Steel and Power's 1,000 MW thermal power plant is proposed. It needs 500 ha of land; none of it has been acquired. The public hearing was conducted in May, it now awaits clearance. The hearing was held about 35 km from the site; even then there was more than 70 per cent objection to the project. The villagers are determined not to allow the plant and say they will intensify the protest in case the project gets cleared. They persist that theirs is fertile land and factories are supposed to be on barren land. But is anybody listening? Earlier renowned for its tussar silk, Raigarh is now a growing hub for the steel and power market. This is the district where the Jindal group has established its empire—the iron and steel plant, the thermal power plant, the industrial park and the coal mines. 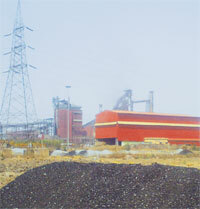 The company's coal-based sponge iron facility is the world's largest and lies just a few kilometres from Raigarh city. With many more players queueing up to set up factories in Raigarh and 50 projects on their way, the district tops the charts. In addition, there are MoUs with 28 companies for 188 projects worth Rs 61,494 crore. And all this over and above existing industries; official estimates count 53 large-scale and 37 small-scale industrial plants—sponge iron plants, iron and steel plants and thermal power plants are the common projects. The district also has 195 mining projects, which are either in the mining or in the prospecting stage. Raigarh's coal-based thermal power capacity is 1,420 MW, including a captive capacity of 390 MW. The district is planning to set up 16,155 MW of coalbased power capacity. Fourteen power projects are in the clearance or the TOR stages while for 30 power plants, MoUs have been signed. This will push up the planned power capacity in the district to over 20,000 MW, 23 per cent of India's present coal-based power capacity. About 30,000 ha of land will be needed for the planned projects, requiring 980 mcm of water per year. Eleven of the 14 planned thermal power plants in Raigarh will withdraw water from the Mahanadi requiring 700 mcm. The district's main river Kelo does not have sufficient water to supply any of the industrial plants. When the projects which have just signed an MoU are added to the tally, the requirements will go up. "Unfortunately, we have coal now, but 10 years later we will have only flyash," said A C Maloo, Raigarh regional officer of Chhattisgarh Environment Conservation Board (CECB), the state pollution control board. "Everyone makes power and takes away our coal to leave behind waste and pollution," he added. 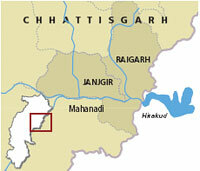 The Directorate of Geology and Mining estimates that half of Chhattisgarh's coal is in Raigarh. Sponge iron units are causing enough pollution and now, Maloo feared, Raigarh's future will be covered in toxic flyash, which the chimneys of coal-fired power plants will spout. Yet Raigarh does not appear in the Central Pollution Control Board's (CPCB) list of most critically polluted areas in the country. The district has just two monitoring stations providing data on the ambient air quality. With such inadequate monitoring infrastructure, the pollution data is underplayed. Owing to the large-scale pollution in the district with flyash dumped on roadsides, agricultural fields being rendered unproductive due to improper char disposal, people are already angry about the industrial rush in Raigarh. A number of public hearings have witnessed protests and open conflict between residents and project proponents. In January 2008, at the public hearing for Jindal Gare coal mines at Khamaria block, there was lathi charge when people started protesting. In August the same year, after violent protest, the police resorted to lathi charge at Mahapalli village. This disrupted the public hearing being held for the expansion of the sponge iron facility of Indus Energy. People shun public hearings and call them a sham. Raghuvir Pradhan of Ekta Parishad , an NGO working in Chhattisgarh, asserted, "Public hearings are a formality the state government carries out, no rules are followed, false reports are sent to the ministry. Even the video footage is tampered with." In June 2009, in a hearing for an industrial estate at Lara, people were arrested following protests and lathi charge. In October 2009, at a public hearing for a thermal power plant of Visa Power, villagers burnt the tents a day before the scheduled hearing to register their protest. The Jindal power plant expansion at Tamnar witnessed protests like never before; the public hearing lasted 12 hours in May 2010. As a result of the growing protests in the district, the number of police at the public hearings exceeds the number of people, admitted Raigarh Superintendent of Police, Rahul Sharma. "People in Raigarh believe if they disrupt a hearing, the project will not get clearance. Instead of expressing their concern and registering their opinion on the project, people tend to get aggressive and resort to violence," Maloo complained. Raghuvir explained that most of these protests happen because people don't want to give away their land at any cost.